This game is called How Can I Get You To Like A Sloppy Delicious Wild Rice Thing All Baked Up In A Pan. To which I say GAME ON. First things first: Minnesota. You should probably come. If you’re ever going to appreciate a cold snowy winter wonderland and pan-o-goodness of chicken and wild rice, December just before Christmas is the time. I’ll crank up the heat in our little house to a nice warm 75 degrees like the perpetually cold energy wasting person that I am, and you can come sit on my couch, snuggle with my favorite used-to-be-white Pottery Barn blanket, smell the wild rice cooking away in the oven, and listen to the crackling fireplace. Oh snap. We don’t have a fireplace. I am a fireplace ledge dweller and therefore this is the most sad thing ever about our adorable house nestled into the cold, frozen land of the Minnesota tundra. It’s basically a crime to live here and not have a fireplace. Maybe in some future house we’ll have a fireplace to cozy up to, but right now, it’s just us and the new fridge. Wait, the FRIDGE! Houston, we have a fridge. There are functioning kitchen appliances in the house other than a blender and a toaster for the first time in months, and I have been slow on telling you about it because I ate all that turkey a while ago and it just… I dunno. It just made me slow at life. Forgive? We are down to a matter of DAYS before the complete kitchen reveal happens! The backsplash still needs to get finished, I need to get my kitchen gear organized (story of my liiife), and we need to hang a few things on the walls. Maybe. Be sure to subscribe to Pinch of Yum on YouTube <— a) because you don’t want to miss the big final kitchen reveal and any recipe videos that will follow! and b) because we? I? Pinch of Yum? has a fantastic, tiny little army of exactly 689 followers, and for that reason I still celebrate every single follower, which means that I will eat an Oreo truffle in celebration when you subscribe. So, like, hurry up. Okay, though, we started out with me trying to make sure you know how great it is to eat chicken wild rice soup in casserole form, especially when topped with buttery golden brown toasty bread cubes. It’s almost unfair for me to make a chicken wild rice casserole because I am so very happy eating chicken wild rice soup forever. I don’t have many recipes that I make more than a few times in my life, but that crockpot chicken wild rice soup is a once-a-month regular. My goal with this casserole wasn’t to replace the soup (hello, NOT POSSIBLE) but more just to offer my hungry self a recipe that could be a real food + comfort food casserole type thing that would give us all the cozy feels of soup without actually being soup. I sort of love casseroles in that very predictable Minnesota winter way, but I also like to try to make them updated to 2014, and this is why Chicken Wild Rice Casserole came into my life. No cans of anything here – just lots of real, healthy ingredients (okay FINE there’s a little butter, too) which kind of feels good, and smart, and grown up and all that stuff, plus it just tastes like a bite of Minnesota home. Real food + comfort food. Essentially what this Sloppy Wild Rice Deliciousness is all about is a good hearty pile of wild rice cooked in broth and carrots, onions, and celery –> then baked with the chicken and the creamy sauce that you’ll make from scratch because you’re awesome –> then topped with the cutest little butter-soaked bread cubes for the looks (rawr) and the delicate crunch. It’s like soup meets buttered bread meets casserole meets Minnesota. Ugh. I just get so happy when those four things collide right into my world. Chicken While Rice Casserole! Real, healthy ingredients and it just tastes like a bite of Minnesota home. Real food + comfort food. Preheat the oven to 350 degrees. Chop the onion, carrots, and celery. Place in a large baking dish. Add the wild rice and the broth. Cover tightly with foil. Bake for 1 hour 15 minutes. When the rice is almost done, melt four tablespoons butter in a small saucepan over medium heat. Add the flour, salt, and poultry seasoning and cook for one minute. Add the milk slowly, whisking to form a thick, creamy sauce. If you want the topping, melt the remaining six tablespoons butter and toss with the bread cubes. (I’ve also made it without the topping and it’s still delicious). When the rice is done, remove foil, add raw chicken and creamy sauce, and stir to combine. Arrange the bread in a layer on top. Turn the heat up to 450 and bake uncovered for another 20-30 minutes until chicken is no longer pink and the bread cubes are golden brown. Top with salt, pepper, and/or parsley for a pop of green color. Also, I must tell —> That fun video thing I was working on in San Francisco earlier this fall? It’s a little blogger photography class – and it’s live! I worked with Brit + Co. to develop a simple course called Photography for Bloggers. I used food (because WHAT ELSE is there) for my teaching purposes, but the idea is that these are photography basics that would help any new blogger – foodies and beyond – up their skills in the photography department by learning manual controls, lighting, and composition. You think you’re an energy wasting person at 75 degrees…I must be the worst human ever because I turn it up to 80. But, in my defense I’m acclimatizing to the Seattle weather from Florida. That’s what I tell myself. BUT, maybe I can try the 75 thang if I am eating this sloppy, wild rice deliciouness in conjunction. It looks comfy cozy enough to make up for my missed 5 degrees! PPinned! Yes….a fireplace is a wonderful thing…especially since I’ve been trying to save energy and keep our heat at 70 or below which clearly is not really low since I have friends that keep theirs at 64 (! ); I think I’d have to wear my winter coat inside if we did that! We built our fireplace with a raised hearth which is truly the best seat in the house on a cold winter day in the east. Love this recipe! As a creamy chicken and biscuit lover, this has all those flavors with a whole new twist on top, plus the bonus of wild rice. Love it! Definitely going to make it! We love our fireplace and woodburning stove. Cozy & warm. Keep our house at about 80 degrees in this freezing, snowy weather. Loved the video Lindsay and Bjork (although I felt a little like a stalker watching this) I promise to subscribe to Pinch of Yum on Youtube and even share if you promise me that I’m not that stalker! The hidden microwave is kind of fun! Another great, versatile and easy recipe that the whole family will actually eat. Don’t really like making alternate kid meals but they would pound this. Know it! But how wild does that rice get? Thanks Ramona! This morning I wore not one but TWO sweaters. Where’s that darn fireplace?! This has comfort and winter soul food written all over it. Looks amazing. Congrats on the kitchen updates. Looks really nice, especially for the cold and wintry season. Can’t wait to try this! Maybe I miss-read… do you chop up the raw chicken or is it left whole? I’ve done both – you can cut it into small pieces or leave it whole, then just shred it when it’s done. But with the topping that gets sort of messy, so I added a note about cutting it up beforehand. This post totally makes me nostalgic for the Twin Cities (lived there 4 years before moving to WI, where I do happen to have a fireplace!) You are welcome to come over to make indoor s’mores at any time. Please bring this casserole. 1. I grew up in Iowa, so naturally, I’m obsessed with this casserole. Cannot wait to try this! I love that it has all “real” ingrediants! and I am excited about the homemade creamy sauce. Do you think it would work well in other creamy dishes? Thanks! Love your recipes! I love reading your posts. The energy and enthusiasm with which you write is just so contagious. 🙂 By the way, if you feel you are an energy wasting person by keeping the temperature at 75 degrees in your home, what would you think of me who usually keeps it at 82 degrees. AND I live in New York, which is not even close to being as cold as Minnesota or so I’ve been told. There are very few things better than the comfort of chicken + rice, but then you throw casserole in there and it becomes a mega ultra comfort food!! Yummmmm and cozy. This recipe looks delicious, even coming into summer as I’m in Australia. But what on earth is chicken seasoning? Is there an Australian equivalent? I would love to try this recipe, however, I would probably cut the butter amount in half…. !! Congrats on the appliances!That stove is fabulous – as is this comforting and healthy casserole! Hahahaha – too funny! I love that Shashi! Your kitchen is beautiful, I loved the video! your kitchen is very very nice….im not a casserole person but you make it look soo freaking delicious! Love your chicken wild rice soup, so this is on my short list. Might get made tomorrow if we don’t lose power here in “sunny” California. 3″ of rain in 24hr with 40mph winds = storm of the decade here. I love the appliances. Hidden fridge…very cool. I read on another blog that if you keep your thermostat under 70 you burn an extra 100 calories a day….probably because your FREEZING to death. Omg, yum. 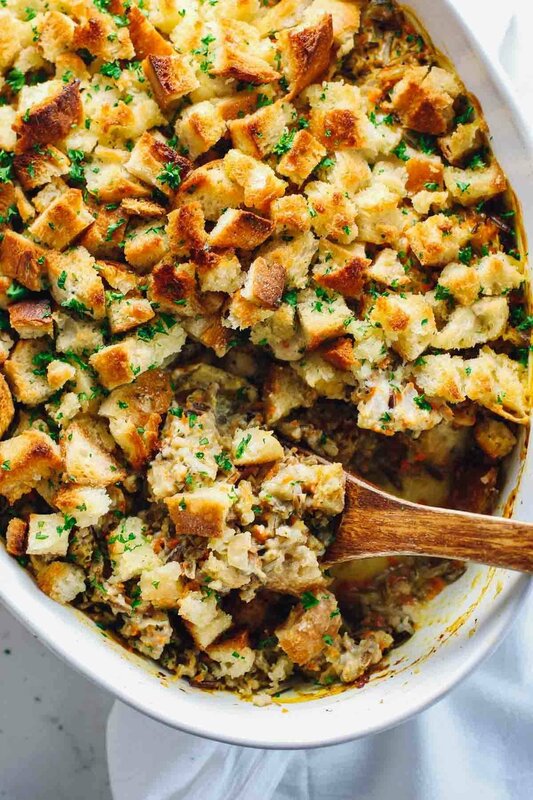 This casserole screams Midwest winter comfort. I love it! Especially anything with bread on top. The best part about fireplaces is the smell of wood burning! Smells both like a summer campfire and a Christmas fire at the same time. Look yummy! I’ve never been to Minnesota (Mississippian here), but my aunt (who just moved to Minnesota) just gave me some Minnesota wild rice! Wasn’t sure what to do with it until I saw THIS post! Can’t wait to try this recipe. Nice! yay for Minnesota Wild Rice! Nice! Stuffing on top sounds awesome. Can I substitute long grain white rice? We’re in California and we still use our fireplace. Love it. 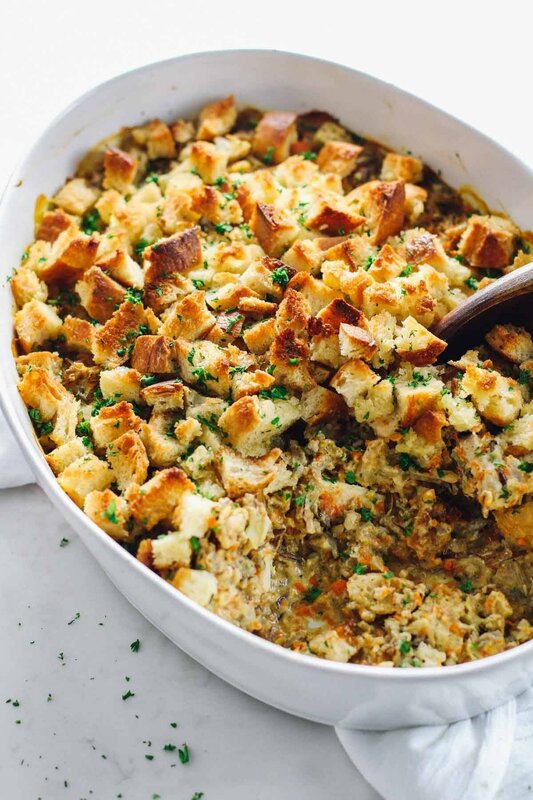 The recipe looks great… almost like stuffing.